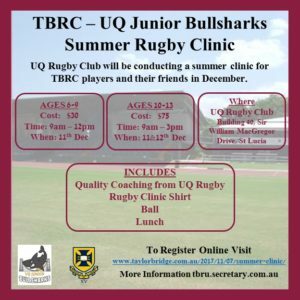 Thanks to our partnership with UQ Rugby we are delighted to offer all members and friends the opportunity to receive first class coaching as part of the UQ Rugby Summer Clinic. These prices are incredibly good value and are only possible because of our relationship with UQ Rugby. For ages 10-13 there is a 2 day clinic, and for the 6-9 year olds we have 1/2 day session. It is fabulous to see UQ Rugby take the initiative with this program. Who better to develop your skills than the current Premiers and eight times club champions? AGE 10-13, just $75 for two days of skills development.